More than seventy years after her death, Virginia Woolf continues to be a source of inspiration, analysis, interest, and admiration. Emphasis on a small number of famous events in her lifetime has turned her into a mythological figure that, at times, may have little resemblance to the flesh-and-blood woman behind the brand. Yet besides the stories of her breakdowns, her ‘madness,’ her snobbishness, her suicide, and the sexual abuse she suffered, there’s much more to tell about the writer who was at the forefront of twentieth-century Modernism. 2. An often told, and no doubt often embellished family anecdote recalled how James Pattle, Virginia Woolf’s great-grandfather on her mother’s side, notoriously drank himself to death. As a member of the Bengal Civil Service, Pattle had to be sent back to England in a cask of rum. During a storm, however, the cask exploded, and his widow, at the shock of seeing her late husband’s body in such a state, died instantaneously. The soldiers aboard the ship, or so the disputed story goes, drank the rum. 3. Virginia Woolf had very mixed feelings about Thomas Hardy’s skills as a writer. ‘I think he had genius & no talent,’ she wrote in 1936, and although this may sound harsh, her judgement was not entirely derogatory. Although she thought his novels were ‘full of inequalities,’ ‘lumpish,’ and ‘dull,’ she praised his capacity for ‘moments of vision’ in which ‘a single scene breaks off from the rest.’ The title of her own autobiography, Moments of Being, is a clear tribute to Hardy. 4. In April 1935, Virginia and Leonard Woolf decided to drive through Germany as part of their annual holiday. Although they made light of the possible dangers of this endeavour, in Bonn they found the streets lined with Nazi supporters awaiting the arrival of Hermann Goering. Leonard would later recall that, for miles, he ‘drove between two lines of corybantic Germans’ who, at the sight of their pet monkey Mitz, delightedly shouted ‘Heil Hitler!’ and ‘gave her (and secondarily Virginia and me) the Hitler salute with outstretched arm.’ Virginia, for her part, raised her hand and waved back. Been called the Bread & Butter Letter. Who’s upper-middle through and though? And Sunday morning game of bowls. He only hopes that Mrs Woolf’ll. If you enjoyed this post, you might also enjoy our compilation of the best Woolf novels to read. Viola van de Sandt is a postgraduate student in English literature at King’s College, London. She loves writing about women in English and American novels, and does exactly that on her own blog, “Broken Glass”. 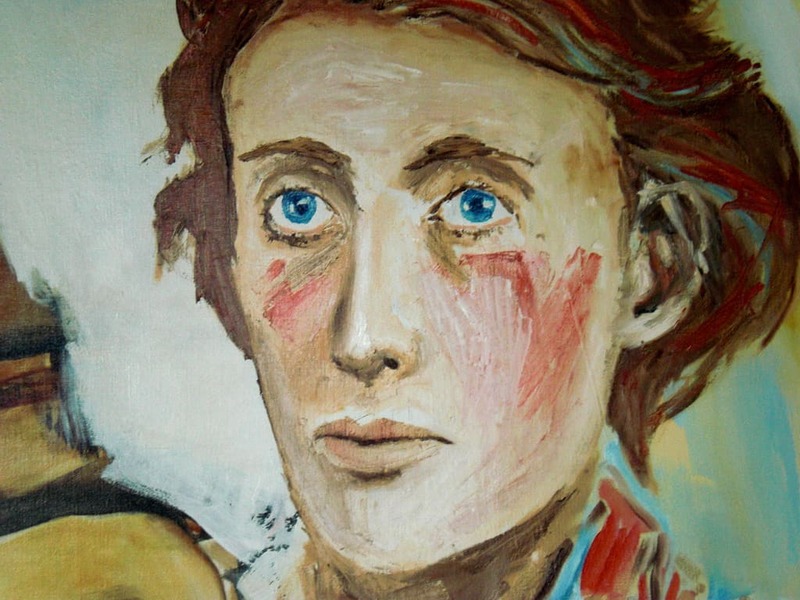 Image: Christiaan Tonnis ~ Virginia Woolf / Oil on canvas / 1998, Christiaan Tonnis, share-alike licence. Here’s another one: Mrs Woolf was absolutely nuts. She committed suicide by stuffing her pockets with rocks and jumping in a river. She attributed the suicide (in a note) to voices in her head getting unbearable. There is a song by the band called Florence and the Machine about her suicide. I mean, it’s deduced to be about her suicide. The song is called What the Water Gave me. Fantastic band. Fantastic song. I’ve never thought about the song that way! Now I must carefully listen to the lyrics… F+M is great! Really enjoyed this post, and in particular the friendly, lighthearted intimacy of Eliot’s rhymes. PS In researching war time (WWII) correspondence in the family, I find letters between my grandmother and the Hogarth Press (including from Leonard). They are full of the usual writerly murmurs about ‘are you actually going to get around to publishing my book and if so when’. Thank you for this wonderful post on Woolf. The Eliot poem was perfect and shows that she did enjoy great friendships and life in general despite her mental afflictions. On a day when I am suffering a terrible headache, I’ve been rewarded for turning on my computer with this latest post from Interesting Literature. I spent many years studying Woolf’s writing and her biography while I was in graduate school. She will always have a special place in my heart and my mind. Another informative and excellent post from the always Interesting Literature! Sadly Virginia Woolf doesn’t do it for me. Ironically Thomas Hardy does … perhaps it is the level of society they write about? I have always found Hardy to write authentically about people, especially his heroines. They held my attention and sympathy easily. The characters in Woolf’s books singularly failed to do this. The self-absorbed ‘Mrs Dalloway’ I found particularly repellant and that and ‘To the Lighthouse’ and ‘Orlando’ simply led me to believe her writings pretentious and self indulgent. I do realise I am in a minority here but I have often wondered if they would ever have been printed if she had not moved in elitist circles and her husband had not been a publisher. This does not however stop me for having sympathy for her mental health and deploring that she should have felt so tormented as to take her own life. What about her prose? Her characters do float in high society, and I fail to get emotionally attached to any… But Woolf’s writing and depth of thought always conquer me in the end. Perhaps it is the depth of thought that annoys me so much? Reading several paragraphs about the way a character strokes her own arm does not amuse me. I understand. :) To each her own, of course. Much debate is to be had over what is good writing, as is with any art form. I hope you didn’t think I was claiming that her writing is unequivocally good. :) To be honest, the run-on sentences and extensive description get to me, too. there are many odds about a writer but for virginia woolf it is kind painful for her exit via suicide. Pingback: This is not a post | "Broken Glass"
Interesting to read about Woolf’s love and hate of Hardy’s writing. ‘He had genius but no talent.’ Flashes of inspiration but no overall aptitude for writing, she seems to be saying. Bit harsh don’t you think!! Grazie a tutti per gli interessanti commenti su VW. Ho letto molti suoi libri, e scritto la mia tesi di laurea sul suo Feminism… Mi piace molto anche Hardy e, specialmente ,il gioco di luci ed ombre in Tess. Ho deciso di scrivere il mio commento in Italiano per farvi “assaggiare” qualche parola nella mia lingua. Appropos fact 2, it is a well known that the same thing happened with the return of Horatio Nelsons body after his death at Trafalgar when the crew drank the brandy. By the time his body reached London it was in such a dreadful state his coffin had to be heavily lead lined so that the crowds at his State Funeral would not be overcome by the rancid smell. I love reading these bits culled from the lives of literary figures. My favorite is her insight about Hardy, something that I think can apply to a good many writers. It’s like an athlete “being in the zone.” Great athletes find themselves in the zone more often than those of lesser talents. But I also think that good athletes can achieve “greatness” or find themselves in the zone more frequently just by showing up for work every day and working hard. Reblogged this on Musings of a Twenty-Something. Love the little poem by T.S. Eliot. The story about Woolf’s disapproval of Ulysses reminds me of André Gide’s initial disapproval of Proust’s In Search of Lost Time… Interesting disapprovals! Reblogged this on Moments of Awareness. Still one of my favorites. Ever since high school, way back when she was definitely not in the required reading list. i enjoyed this post very much. So, Woolf didn’t think much of Joyce or Hardy (I love her comment about Joyce’s style). What writer did she especially like? Whom did she place among the literary giants? I would love to know.